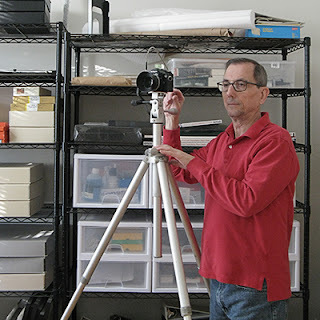 See enclosed for some photos of my old Leitz Tiltall. The model is #4602 and is an E. Leitz product made in Rockleigh, NJ. It was purchased used in 1979 ($60.00) and I have had it since then. The new short handle is a real improvement for me...easier to carry, set up and use. The camera platform pad can be replaced with a sheet of EPDM rubber gasket material (about 1/6" thick). These are available at most hardware stores in the plumbing department and can be cut to fit. I cut one edge of the circle to allow the aperture ring on my Nikon FM to turn freely. After removing the old pad and cleaning the aluminum plate, you can attach the rubber with 3M transfer tape or sheet. The camera pad could be removed if needed without trouble or mess. The EPDM rubber keeps the camera from rotating and is very wear resistant. 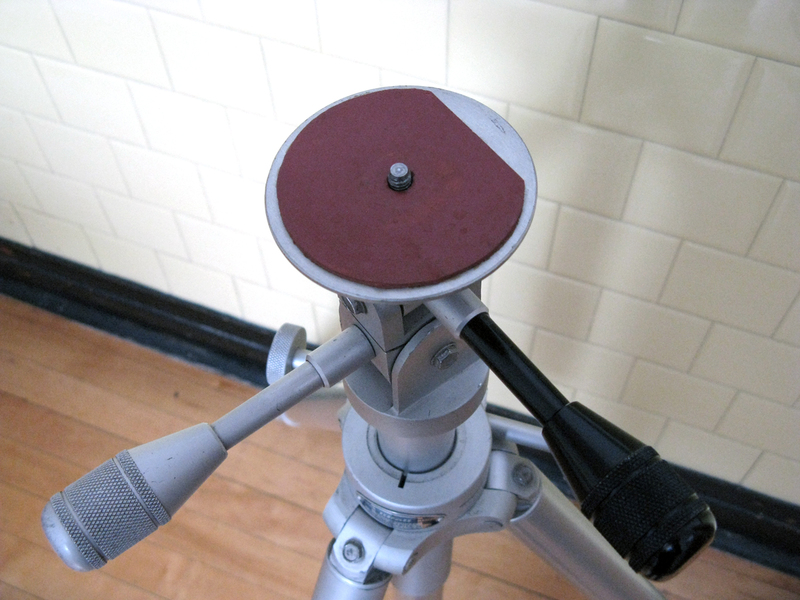 Keep the threads on the tripod screw very lightly lubricated. This was done long before I had found your website! When I received the short black handle, it was obvious it would not thread far enough to actually exert any clamping force on the head. After reading your site, I agreed that bushings would be the best solution. However I felt in this situation steel would not be the best material: consider using a Bronze Sleeve Bearing. The bronze will not react with the aluminum collar or steel bolt and allows the handle to tighten without potentially galling the end of the handle. 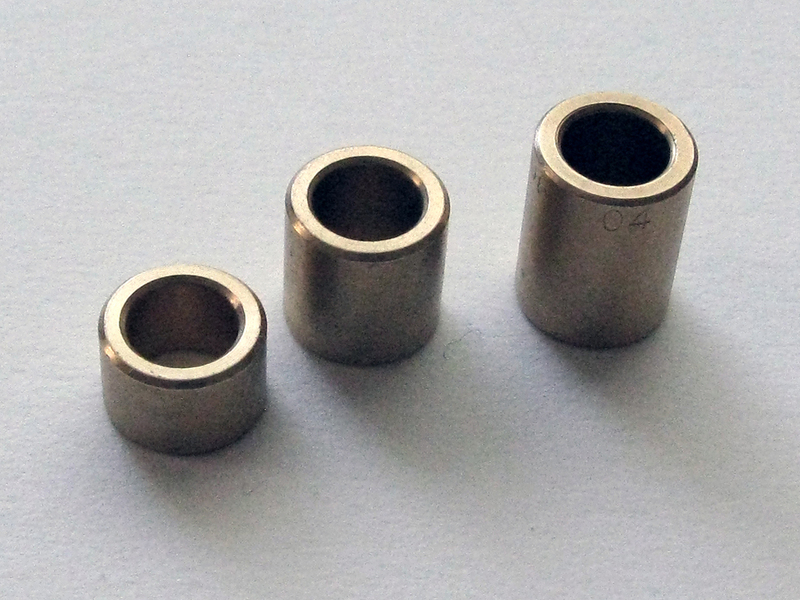 A steel sleeve bearing could potentially gall the aluminum collar. When disassembling the handles, the collars surrounding the bolts might be loose. Just remove them, clean the bolts and collars with some denatured alcohol. Removing the collars exposes more of the bolt threads for cleaning. The alcohol cuts the grease and dirt very efficiently and leaves no residue. After that, some 400-600 grit wet or dry sandpaper can be used to smooth any rough aluminum on the handle end before reassembly. Put a small amount of white lithium grease on the collar threads and tighten carefully into the body of the head. Use gaffers or duct tape on the collar to prevent the pliers from damaging the collar...tighten 'gingerly.' You want the handle to turn but not the collar! Add some white lithium grease to the bolt and the bronze sleeve bearing and reassemble. It should work very smoothly and exert proper clamping force without having to over tighten the handle. I ordered the Bronze Sleeve Bearings from McMaster-Carr supply company. To be sure I ordered 1/4", 3/8" and 1/2" lengths of the 1/4" ID x 3/8" OD bearings. Part numbers are: 6381K412 (1/4" long), 6381K413 (3/8" long) and 6381K415 (1/2" long). The 3/8" length works perfectly on my tripod. You might check the 1/4" length for fit and function as the more threads engaged on the handle the better. Price and shipping service can't be beat. 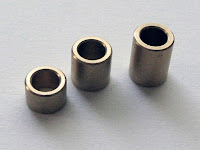 http://www.mcmaster.com/#standard-sleeve-bearings/=zer3in. Some white lithium grease can also be used for the center column and panning locking handles to keep them turning smoothly. When cleaning these handles, always check for galling on the ends and smooth before reassembly. It is also a good idea to check the brass tripod leg locking bushings. Clean thoroughly and apply a small amount of white lithium grease to the threads. You need just enough to coat the threads without attracting grit and dirt.